Wonderful view overlooking the valley. Bali Activity An exciting and exhilarating white water rafting experience on spectacular Telaga Waja River at affordable price includes safety equipment, lunch, changing room, shower room and other facilities. An exhilarating white water rafting experience through wild countryside, tropical rain forest, lush jungle scenery, deep river gorges and breathtaking waterfalls. Drop at the office of international rafting company in Sanur, payments and check-in. （For the guests stay in Ubud area check in at rafting receptionist）. ・Change clothes and keep clothes and other goods in the car. You can take your goods back at the restaurant. ・Keep your valuables(camera, wallet etc) in safety bag. ・Wear safety equipment and go to the river. ・Take a break at river bank where the rafters can enjoy a spectacular waterfall scenery. 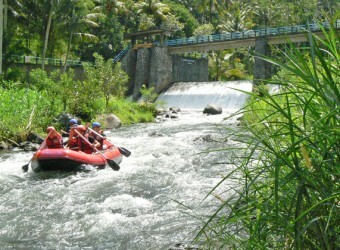 Bali International Rafting, Telaga Waja Adventure and Bali Rafting take a break at the same place. （About 1 hour 20 minutes after start）Down 4m drop point! ・Outdoor shower and indoor shower room facilities. ・Go up the steps from the restaurant. * The Above Pick up Time And Return Time Are Approximate Time. * Pick up Transport Service To Many Hotels,May Not Be Able To Pick up On Time. White water rafting adventure is suitable for people between the ages of 7 and 60. It was the first time for me joined rafting. I was a little afraid but I could fully enjoy it. Drinks at the break time in the middle was very expensive.